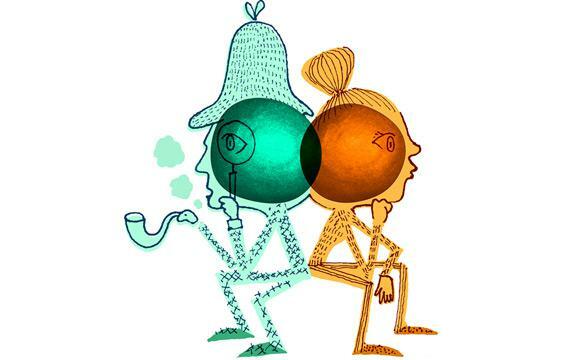 How to think like Sherlock Holmes: See and observe to fight attention blindness; be happier. What the detective can teach us about observation, attention, and happiness. I do not think like Sherlock Holmes. Not in the least. That was the rather disheartening conclusion I reached while researching a book on the detective’s mental prowess. I’d hoped to discover that I had the secret to Sherlockian thought. What I found instead was that it would be hard work indeed to even begin to approximate the essence of the detective’s approach to the world: his ever-mindful mindset and his relentless mental energy. Holmes was a man eternally on, who relished that on-ness and floundered in its absence. It would be exhausting to think like Sherlock. And would it really be worth it in the end? To both see and observe: Therein lies the secret. When I first heard the words as a child, I sat up with recognition. Like Watson, I didn’t have a clue. Some 20 years later, I read the passage a second time in an attempt to decipher the psychology behind its impact. I realized I was no better at observing than I had been at the tender age of 7. Worse, even. With my constant companion Sir Smartphone and my newfound love of Lady Twitter, my devotion to Count Facebook, and that itch my fingers got whenever I hadn’t checked my email for, what, 10 minutes already? OK, five—but it seemed a lifetime. Those Baker Street steps would always be a mystery. Over the past several decades, researchers have discovered that mindfulness can lead to improvements in physiological well-being and emotional regulation. It can also strengthen connectivity in the brain, specifically in a network of the posterior cingulate cortex, the adjacent precuneus, and the medial prefrontal cortex that maintains activity when the brain is resting. Mindfulness can even enhance our levels of wisdom, both in terms of dialectism (being cognizant of change and contradictions in the world) and intellectual humility (knowing your own limitations). What’s more, mindfulness can lead to improved problem solving, enhanced imagination, and better decision making. It can even be a weapon against one of the most disturbing limitations that our attention is up against: inattentional blindness. When inattentional blindness (sometimes referred to as attentional blindness) strikes, our focus on one particular element in a scene or situation or problem causes the other elements to literally disappear. Images that hit our retina are not then processed by our brain but instead dissolve into the who-knows-where, so that we have no conscious experience of having ever been exposed to them to begin with. The phenomenon was made famous by Daniel Simons and Christopher Chabris: In their provocative study, students repeatedly failed to see a person in a gorilla suit who walked onto a basketball court midgame, pounded his chest, and walked off. But the phenomenon actually dates to research conducted by Ulric Neisser, the father of cognitive psychology, in the 1960s and 1970s. One evening, Neisser noticed that when he looked out the window at twilight, he had the ability to see either the twilight or the reflection of the room on the glass. Focusing on the one made the other vanish. No matter what he did, he couldn’t pay active attention to both. He termed this phenomenon “selective looking” and went on to study its effects in study after study of competing attentional demands. Show a person two superimposed videos, and he fails to notice when card players suddenly stop their game, stand up, and start shaking hands—or fails to realize that someone spoke to him in one ear while he’s been listening to a conversation with the other. In a real-world illustration of the innate inability to split attention in any meaningful way, a road construction crew once paved over a dead deer in the road. They simply did not see it, so busy were they ensuring that their assignment was properly carried out. Inattentional blindness, more than anything else, illustrates the limitations of our attentional abilities. Try as we might, we can never see both twilight and reflection. We can’t ever multitask the way we think we can. Each time we try, either the room or the world outside it will disappear from conscious processing. That’s why Holmes is so careful about where and when he deploys that famed keenness of observation. Were he to spread himself too thin—imagine modern-day Holmes, be it Benedict Cumberbatch or Jonny Lee Miller, pulling out his cell to check his email as he walks down the street and has a conversation at the same time, something you’ll never see either of these current incarnations actually doing—he’d be unable to deploy his observation as he otherwise would. Enter the email, exit the Baker Street steps—and then some. It’s not an easy task, that constant cognitive vigilance, the eternal awareness of our own limitations and the resulting strategic allocation of attention. Even Holmes, I’m willing to bet, couldn’t reach that level of mindfulness and deliberate thought all at once. It came with years of motivation and practice. To think like Holmes, we have to both want to think like him and practice doing so over and over and over, even when the effort becomes exhausting and seems a pointless waste of energy. Mindfulness takes discipline. Even after I discovered my propensity for sneaking over to email or Twitter when I wasn’t quite sure what to write next, the discovery alone wasn’t enough to curb my less-than-ideal work habits. I thought it would be. And I tried, I really did. But somehow, up that browser window popped, seemingly of its own volition. What, me? Attempt to multitask while writing my book? Never. And so, I took the Odyssean approach: I tied myself to the mast to resist the sirens’ call of the Internet. I downloaded Freedom, a program that blocked my access completely for a specified amount of time, and got to writing. The results shocked me. I was woefully bad at maintaining my concentration for large chunks of time. Over and over, my fingers made their way to that habitual key-press combination that would switch the window from my manuscript to my online world—only to discover that that world was off-limits for another … how long is left? Has it really been only 20 minutes? Over time, the impulse became less frequent. And what’s more, I found that my writing—and my thinking, it bears note—was improving with every day of Internet-less interludes. I could think more fluidly. My brain worked more conscientiously. In those breaks when, before, there would be a quick check of email or a surreptitious run to my Twitter feed, there would be a self-reflecting concentration that quickly rummaged through my brain attic. (You can’t write about Holmes without mentioning his analogy for the human mind at least once.) I came up with multiple ways of moving forward where before I would find myself stuck. Pieces that had taken hours to write suddenly were completed in a fraction of the time. Until that concrete evidence of effectiveness, I had never quite believed that focused attention would make such a big difference. As much research as I’d read, as much science as I’d examined, it never quite hit home. It had taken Freedom, but I was finally taking Sherlock Holmes at his word. I was learning the benefits of both seeing and observing—and I was no longer trading in the one for the other without quite realizing what I was doing. Self-binding software, of course, is not always an option to keep our brains mindfully on track. Who is to stop us from checking our phone mid-dinner or having the TV on as background noise? But here’s what I learned. Those little nudges to limit your own behavior have a more lasting effect, even in areas where you’ve never used them. They make you realize just how limited your attention is in reality—and how often we wave our own limitations off with a disdainful motion. Not only did that nagging software make me realize how desperately I was chained to my online self, but I began to notice how often my hand reached for my phone when I was walking down the street or sitting in the subway, how utterly unable I had become to just do what I was doing, be it walking or sitting or even reading a book, without trying to get in just a little bit more. Statue of Sherlock Holmes on Picardy Place in Edinburgh, Scotland, Conan Doyle’s birthplace. The statue shows Holmes wearing an Inverness cape and a deerstalker cap. I did my best to resist. Now, something that was once thoughtless habit became a guilt-inducing twinge. I would force myself to replace the phone without checking it, to take off my headphones and look around, to resist the urge to place a call just because I was walking to an appointment and had a few minutes of spare time. It was hard. But it was worth it, if only for my enhanced perceptiveness, for the quickly growing pile of material that I wouldn’t have even noticed before, for the tangible improvements in thought and clarity that came with every deferred impulse. It’s not for nothing that study after study has shown the benefits of nature on our thinking: Being surrounded by the natural world makes us more reflective, more creative, sharper in our cognition. But if we’re too busy talking on the phone or sending a text, we won’t even notice that we’ve walked by a tree. If we follow Holmes’ lead, if we take his admonition to not only see but also observe, and do so as a matter of course, we may not only find ourselves better able to rattle off the number of those proverbial steps in a second, but we may be surprised to discover that the benefits extend much further: We may even be happier as a result. Even brief exercises in mindfulness, for as little as five minutes a day, have been shown to shift brain activity in the frontal lobes toward a pattern associated with positive and approach-oriented emotional states. And the mind-wandering, multitasking alternative? It may do more than make us less attentive. It may also make us less happy.